Ideally situated in the bustling centre of Athens, opposite the National Gardens and the Parliament building, Amalia Hotel provides easy access to all the capital's main tourist attractions, as well as to the airport and the coastal zone. The city metro, most urban buses and the tram are within a so-metre radius from the hotel. The spacious guestrooms, which open to exquisite views, are especially designed to meet the needs of the most discerning guests. All rooms are appointed with air condition, fu II mini-bar, direct-dial telephone, flat screen TV with Satellite channels and video on demand, Internet connection, safe, bathrobe and hairdryer. 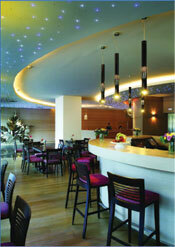 Guests can relax in the hotel lobby lounge "Chrysalis", an ideal place for a sociable welcome or an informal meeting. They can enjoy special dishes from the Mediterranean cuisine, have a drink or coffee and savor deserts after a tiring day in the city. The hotel restaurant also serves a wide variety of international and local dishes in a friendly atmosphere with stunning views of the Park. 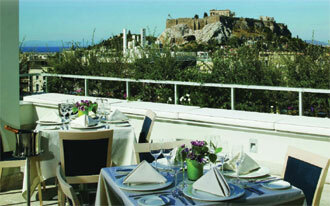 At the roof-garden, guests can enjoy a breathtaking view of the city along with an array of carefully selected delicacies of Greek, Mediterranean and fusion cuisine. Other services include valet, concierge, 2s-hour room service, in-room safe, in-room movies, business centre, gym with cardio equipment, Internet corner and Wi-Fi connection in all public areas. The hotel boasts five function halls offering 500 square meters of meeting space with natural lighting, which can accommodate any kind of business or social events. 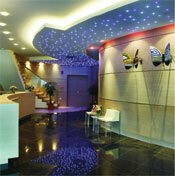 There is also audiovisual equipment, secretarial assistance and wireless high-speed Internet access.